Jimmy was probably outpointed in the game against the Sharks by Todd Carney, but not by much really. He threw the final two passes, both beautiful ones, for Daniel Tupou’s first try and Jennings’ only try, and his kick to the wing almost resulted in another to Roger Tuivasa-Sheck but for a hideous decision by the referees. He didn’t run it much, just three runs for 23 metres and a tackle bust, nor did he get the opportunity to kick it: just five for 178 metres. But he did nothing to fall from the top spot, and his passing game — which has been incredible of late — was on song for those two tries. He had a running battle with spurned Blues and Roosters five-eighth Carney, and the two were engaged in a running verbal battle all game. Surprisingly, the Sharks didn’t run it at him given his recent defensive struggles, forcing him into just six tackles as they sent the majority of traffic at Samisoni Langi, who missed five. 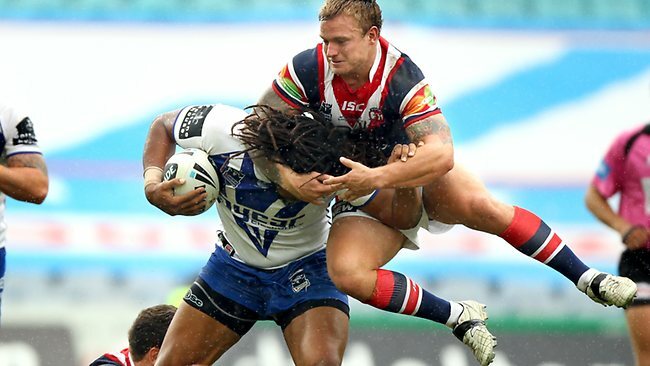 Friend had several driving runs and repelled Fifita and Gallen all game with his incredible pound-for-pound strength, among the best in the NRL. He had a clearing kick aiming for a 40/20 early, and did his best to get the team back on top in a much-improved second half. He had a line break, two tackle busts, five runs for 43 metres and 35 tackles with just the solitary miss. It was another solid performance for the young rake whose rise has been impressive all year and continues to rocket up the rake rankings. Well based on that, Mitch is a terrible halfback because he couldn’t pull a team out of a 26-0 halftime deficit. It’s just absurd. He didn’t have the influence he’s had on games since Origin, but that’s not to say he played poorly. Defensively he was huge, with 25 tackles and two one-on-ones, including one on a rampaging Fifita in the first half. Indicative of the game though, he kicked it just six times for 159 metres. 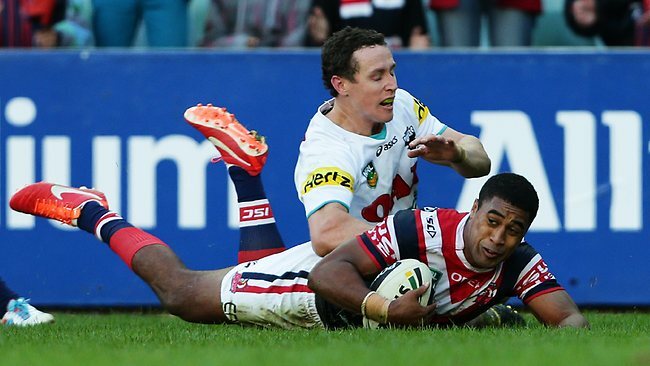 With Friend and Maloney’s kicks, the Roosters put boot to ball just 12 times. He’s a great young captain in the making, yet as is standard with Roosters captains, he was barely given an ear to chew despite his best efforts. The Beast kinda fell back into old habits in this one, with a shoulder charge penalty followed by a late hit, yet his effort levels were there and he rag-dolled a few of their players like they were a rug covered in sausage roll crumbs. He stood up when he needed to and ran the ball hard and often, with 15 for 120 metres and 39 tackles. Gallen got over the top of him but not by much, and he looked absolutely buggered when he went off for his mandatory rest at 25 minutes. We need JWH from the Round 16 Manly game though, and my fear is he’s become exhausted as the season has worn on despite the five-week mid-season rest. I hope I’m wrong, because “Manly game JWH” gives the Roosters their best chance of winning the premiership. The big fella was far too focused on giving Beau Ryan some curry and gave away four penalties in the game, by far his most undisciplined performance of the year. He’s been getting noticeably more pissed off as the season has worn on, perhaps being run down by an extended and more physical rugby league season. His first half was well short of what he’s capable of. But the second half, he turned it back on. He sparked a club with a few near-line breaks, a try assist that was called back and great defence. He also popped up at one stage on a clearing kick from the Sharks to support RTS on a kick return, sending Tupou down for a run down the edge. He has a switch that he can flick and become the best player in the NRL when he wants to, and that’s the reason why the Roosters will be hard to stop in the semis — he’s sure to be “on” for those games, and piddling rivalries with the Jay Leno of the NRL won’t be a focus in the big ones. Against the Sharks he ended up with 12 runs — eight of them in the second half — for 102 metres and three offloads for two line break assists. But those four penalties in the first half put the team under a ton of pressure, and more than anything this is the game HE had to have. What a sensational player. He truly is a one-of-a-kind athlete, worth the price of admission on the mere hope or prayer that something like this happens in a game. And he’s beginning to do it far more regularly. Against the Sharks in his final game at fullback before Mini returns, he had one of his best halves as a pro having seemingly warmed to the task at fullback after five good-but-not-great halves back there. The Sheck ran it 14 times for 142 metres with five tackle busts and the above line break and try assist. he also supported well for the no-try and positionally figured it out better in the second half. He’s due for a monster year at the back next season with Mini tutoring him and with a whole pre-season to work on the subtleties of the role. That move above will become the rule rather than the exception, especially if SBW’s offload sticks around for another year. Jenko just didn’t get the ball in this one — only 14 receives — but still managed to score a try and set one up, while the offload he pulled off to enable the no-try to the Nightcrawler was special. In just six runs he made 51 metres, four tackle busts, a line break, a line break assist, a try assist and an offload. Not a bad night’s work for a superstar who barely touched the thing. I just love watching this guy play, and defensively his renaissance continued with 12 tackles and just the solitary miss. What a great signing he’s been for this club; one they touted as a signature that completed the team prior to kick off. It’s hard to argue with that. Take his two tries out of it and he still had a fantastic outing against the Sharks, with nine runs for 124 metres, seven tackle busts and three line breaks. What a prospect this kid is. He wasn’t on the fan’s radar to start the year, but now he’s on that radar and beeping constantly like Elaine’s organiser. But unlike that defective piece of junk, this kid is a keeper. He had 12 runs for 110 metres with two tackle busts and 20 tackles on the other side. He doesn’t give away penalties and doesn’t make errors, and his offload is a season away from becoming a real weapon for this team. We are looking at a future where Liu will offload to The Nightcrawler through a gap — but we live in a present where Liu doesn’t have a sick nickname. Not yet anyway. So I challenge Roosters fans: come up with a nickname for Liu, and the winner will get FREE ACCESS to this site. That’s right, never pay for an article again! His impact in attack is short of what Boyd Cordner was providing as a left-edge second rower, but his defence against the Sharks was first-rate with 39 tackles in an 80-minute performance. He ran it just nine times for 61 metres and was not given the opportunity to hit those gaps as more often than not MP7 dumped it back for The BBQ on the double decoy play to great effect in the second half. Of course! I had heard that name somewhere but forgot it, great nickname! Goes with the whole x-men theme as well: Nightcrawler, Ice…I guess Moa is the Juggernaut? Cheers Sandra! You now have free access to this site in perpetuity. You must be positively stoked!